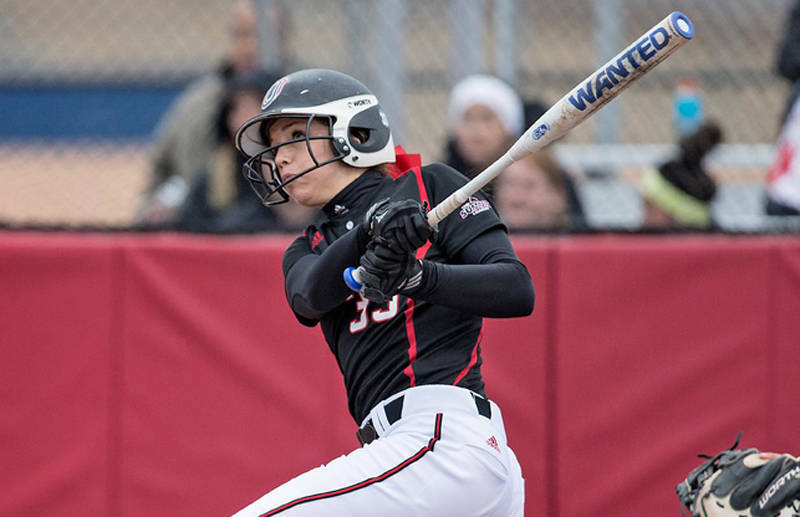 Omaha, NE – The University of Nebraska at Omaha softball team started the 2015 home schedule with two games against the Bears of the University of Northern Colorado. Heading into Tuesday’s games, the Mavericks were 1-3 in the Jayhawk Invitational, including a 1-0 win against Saint Louis. The Slow start on the year is something Head Coach Jeanne Scarpello has addressed the team about. Tuesday’s opening game started off nicely for UNO on the mound. Senior pitcher Kat Barrow held the Bears hitless through three innings, getting four strikeouts in that time. The UNO offense started off just as hot, with lead-off hits to start the 2nd, 3rd and 4th innings, but they were unable to capitalize. Scoreless at 0-0 heading to the sixth, UNC’s Melissa Marcovecchio hit a solo home-run to put the Bears up 1-0. UNO’s Lia Mancuso responded in the bottom half of the inning in a big way, tripling to start the inning. A fielder’s choice, batter being hit-by-pitch and sacrifice bunt scored two Mav runs and UNO led 2-1 after the sixth. UNC would come back to tie it in the 7th to send it to extra innings. UNO’s Campbell Ditto’s walk-off two-run home-run in the 8th secured victory for the Mavs. Scarpello lauded the work Barrow (5-4) did on the mound, which included a win, eight innings, six hits, two runs and eight strikeouts. In the 2nd game, UNO again came out swinging scoring a run in the 1st inning and five runs off of five hits in the big third inning. An additional run in the 5th and 6th gave UNO the 8-0 mercy rule victory. Freshman Jaylee Hinrichs (5-4) got the win and pitched brilliantly, throwing six innings allowing one hit and no runs while striking out five. Campbell Ditto went 3-for-5 with 3 RBI in the double-header wins for UNO. Scarpello said the most impressive part of Tuesday was in the first game. Scarpello said winning the first two home games is important, but it’s also the next step in the process. UNO (12-13 overall, 0-0 Summit) has a string of six more home games in the next ten days, starting with a three game series this weekend against Summit League foe Fort Wayne at Westside Field at Westbrook.